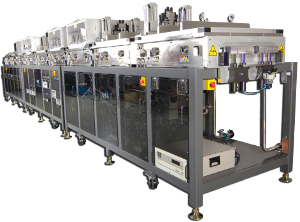 Automatically controlled In-Line thin film PVD Deposition & Etching system. Modular and flexible multi-chamber integration design to accommodate various substrate sizes. Automatic process control, visualization of the recipe management and process, data management and process documentation. Fully automatically controlled In-Line thin film PVD Deposition & Etching system for high throughput and reliable manufacturing processes. Modular and flexible multi-chamber integration design to accommodate various substrate sizes, offering exceptional production flexibility. Optimized system design for Linear/RF Plasma Etch, Planar/Rotary Magnetron Sputtering, Evaporation processes, with superior thin film deposition and etching uniformity. Windows based user friendly GUI software with FAB integration of SEMI GEM/SECS interface, and industrial standard DeviceNet/PLC control system for ease of operation, maintenance, support and upgrades. Fully automatic process control, visualization of the recipe management and process, data management and process documentation.